Most everyone knows about the summer Milky Way, the beautiful, coarse band of stars that arches across the sky from the south to northeast horizons in July and August. (See June 28 - July 4; July 5 - 11; July 12 -18.) The winter sky, too, has its Milky Way, though it differs from the summer Milky Way in that it is slightly fainter and more difficult to see from areas near light-polluted cities. Still, if you are fortunate enough to live in an area free of light pollution, or if you are able to get away to such a location, you can see the winter Milky Way this time of year high overhead around 9 o'clock. Like its summer counterpart, the winter Milky Way is punctuated by many bright star clusters, some of which, in a dark sky, look like tiny, isolated clouds to the unaided eye. But whereas the brightest clusters in the summer Milky Way appear predominantly in its southern reaches - in the constellations Sagittarius and Scorpius - the winter star clusters are distributed fairly evenly throughout, giving the winter Milky Way an overall softer luster. Moreover, the summer Milky Way is bisected by what look like dark rifts, which are actually clouds of interstellar dust blocking the light of more distant background stars. The winter Milky Way, too, contains such dust, but it is not as obvious. Why do the winter and summer Milky Ways look different? It largely has to do with Earth's vantage point in our home galaxy. If we could transport ourselves outside our galaxy, we would see that it is really a flat disk of hundreds of billions of stars interspersed with dark lanes of interstellar dust. The Sun is embedded near the mid-plane of this disk in a quiet galactic 'outback' located some 27,000 light-years from the center of the Milky Way. On summer evenings, the Earth's night side faces toward the center of our galaxy. Like the heart of a great metropolis, this area contains the densest and brightest star clouds. In winter, however, our nightscape is in the opposite direction, toward the outer arms of the Galaxy, where the stars thin out like porch lights on the edge of town. Hence the winter Milky Way presents a more demure vista. The Milky Way actually traces out our galaxy's spiral arms, which wind out of its center like a pinwheel. The arms contain the dust and gas that give rise to stars. The stars, which at first seem so randomly placed, actually help astronomers map our galaxy's structure from the inside out. 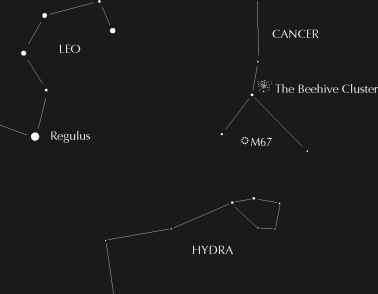 Astronomers have mapped out two specific spiral arms in the winter sky: the Orion Arm, which the Sun inhabits, and the Perseus Arm, which is located at a greater distance along the galactic plane. The summer section of the Milky Way extending into Sagittarius is called, predictably enough, the Sagittarius arm. Although the winter Milky Way may not appear as glorious as the summer Milky Way, it contains more bright stars in a single region than its complement. With the Milky Way high in the sky, as it is between 9 and 10 o'clock in mid-January, run your eye from the zenith toward the south-southeastern horizon. In this quadrant alone, you should be able to count eight very bright stars - nine if you are located far south enough to see Canopus in the constellation Carina. This is the heart of the winter Milky Way.